In the last two blog posts, I looked at the limits on improving productivity compared to growth, and suggested that real changes in yield come with improved working practices and products or services that do not depend on contemporaneous fee-earner input. Coincidentally, yesterday I saw a very good explanation of the issue (defined as ‘the problem of constant cost’) in a guest post by Michael Mills of Neota Logic on the Beaton Capital blog. …quantity in legal services is not necessarily a good thing. We have the diseconomies of scale—internal coordination costs, quality variation—but not enough of the economies, other than branding and cross-selling (when it works). In short, law practice missed the industrial revolution. We didn’t build power looms, and we certainly didn’t build Jaquard looms, programmed by holes in paper cards (the model for the 80-column, cropped-corner punch cards of computing’s adolescence). Forget about billable hours, alternative fees, and ABS’s. The problem is constant cost. Neota Logic’s systems are good examples of the kind of thing I described in my last post — a combination of knowledge and technology increasing law firm productivity. This and systems like it are an inevitable future for firms. The problem, I think, is not in creating these new ways of working, but in ensuring that when they are developed that they flow into the firm as well as possible. How, in other words, does the innovative become the norm? the practice of managing two separate, coherent modes of IT delivery, one focused on stability and the other on agility. Mode 1 is traditional and sequential, emphasizing safety and accuracy. Mode 2 is exploratory and nonlinear, emphasizing agility and speed. I couldn’t stop howling with laughter. It’s basically 2004 dressed up as 2014 and it is guaranteed to get you into a mess. Wardley’s alternative is a system with three parts rather than two. When it comes to organising then each component not only needs different aptitudes (e.g. engineering + design) but also different attitudes (i.e. engineering in genesis is not the same as engineering in industrialised). To solve this, you end up implementing a “trimodal” (three party) structure such as pioneers, settlers and town planners which is governed by a process of theft. The three roles are summarised neatly in this diagram (taken from Wardley’s blog under the Creative Commons Attribution-Share Alike 3.0 License). The problem with bimodal (e.g. 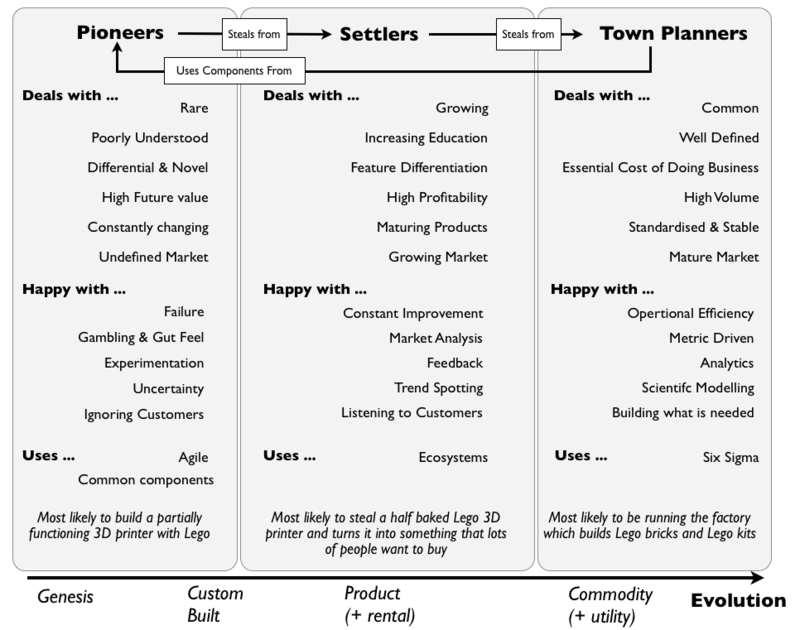 pioneers and town planners) is it lacks the middle component (the settlers) which performs an essential function in ensuring that work is taken from the pioneers and turned into mature products before the town planners can turn this into industrialised commodities or utility services. Without this middle component then yes you cover the two extremes (e.g. agile vs six sigma) but new things built never progress or evolve. You have nothing managing the ‘flow’ from one extreme to another. Whichever terminology is used, the idea is the same. The first wave of change is the responsibility of highly expert groups who work hard and fast to create products and services that might meet particular needs. Some of these might fail, but the speed of work is such that there is always something new to work on. In established businesses, this might be a dedicated research and development function, or it might be an activity open to all (as at Google, for example, where there was an expectation that everyone could spend 20% of their time on their own ideas). When complete, the successful experiments might have proved their worth, but that doesn’t make them ready for widespread adoption. There will inevitably be some rough edges to smooth off, and some issues that could not have been foreseen until the idea needs to be scaled up for general use. That process of perfecting a new product or service is the responsibility of the middle group (the settlers or infantry). Some ideas may fail at this stage too — an idea that works in a lab may hit obstacles when it encounters real life and work. Wardley’s model was designed with technology development in mind, and with the benefit of his extensive experience running successful technology companies. However, I think it is also a valuable template for development more generally in law firms (and probably elsewhere). As an example, knowledge teams in law firms are now an established concept. They commonly work in similar ways when dealing with established aspects of legal practice. The fact that there is a lively market in Professional Support Lawyers between firms, and that many firms have created career pathways for those teams, suggests that this is a ‘town planner’ type of function. But that was not always the case. The first PSLs were experimental. They created their own roles: trying different ways of working, some of which were successful and some weren’t (the pioneer phase). As firms became more familiar with the concept, they jumped on the bandwagon, perfecting the role in different practice groups and in different types of firm (the settler phase). The same process can be seen at play in the way firms are adopting concepts like process-mapping and project management. Here, though, the pioneer phase can be massively foreshortened since these are concepts that have been tried and tested in different sectors before finding their way into the law. Policing and town planning need to change when the context changes. Established knowledge functions need to pay attention to new ideas thrown up by pioneers. That message is at the heart of a recent call by David Griffiths for knowledge and HR functions to start disrupting themselves. When they do, they should consider how the three stages of development might be adapted to their situation. Firms that cannot identify their pioneers need to consider where new ideas are going to come from. (Without those new ideas, the market will move on without them.) If they can point to a group of pioneers, but they expect ideas from that group to become part of ‘business as usual’ without additional work, they risk failure and frustration with the whole process. The latter situation is probably as bad as having no new ideas in the first place. As usual, if you are keen to work out how these archetypes of development might work in your firm, we should talk. Lawyers, accountants and management consultants lie at the heart of the UK’s productivity problem, explaining almost a quarter of a shortfall since 2008. Financial Times research shows that the stagnation of productivity since the crisis is largely explained by just four sectors — professional services, telecommunications and computing, banking and finance and manufacturing. Productivity in professional services has stalled for many reasons including corporate reluctance to fire staff even as business dried up in the recession and subsequent new hires taking time to become more productive. Stephen Denyer, head of City and International at the Law Society, said staff in law firms were spending more time than before on activities that were not “billable hours”, such as business development and compliance. These are probably good explanations, but a much more thorough analysis was provided by Steven Toft for the UK Commission for Employment and Skills. In his piece, Toft concluded that poor productivity at the national level stemmed from poor performance in the workplace. Output growth which cannot be explained by increasing volume of inputs and is assumed to reflect increases in the efficiency of use of these inputs. One big part of TFP is the ‘black box’ of the workplace, and how employers turn skilled workers and tools into products and services which customers value. We may have a more qualified and – if qualifications are of good quality – a more skilled workforce, but are those skills being used effectively? It seems that as world markets have become more difficult in the past decade, many of our work-places have struggled to adapt. The inability to turn a highly skilled population into high productivity is a symptom of failure in the workplace. At its most basic, a firm can be understood as a facility for producing legal advice, information or execution capability. It contains people who do those things in return for fees. There are a number of ways in which their output can be increased. If there is still capacity for additional work, any new instructions (and the fees that come with them) go straight to the bottom line — all additional income increases profit and the profit margin. If there is no additional capacity, new work will require additional people to do it. In this situation, additional work will not increase the profit margin, but it should increase the size of the firm’s profit. In order to extract additional value when capacity appears to have been reached, a firm may insist on more intense production. If, for example, the current target for chargeable hours is 1400, the firm might push for a higher target of 1600 or more hours. (Information about the current range of hours targets in the UK has been collated by the Legal Cheek website.) A change such as this is unlikely to be possible in a short time period, and will almost inevitably come with a cost as salaries rise alongside the additional work requirement. Firms can make changes to the fee-earning machinery. They can shift work from qualified lawyers to paralegals. They can move staff from high-cost centres like London to cheaper areas of the country. They can change their resourcing model to use more contract staff rather than permanent employees. If the value of the work produced does not change, any and all of these changes will shift the revenue per fee-earner equation in a positive direction for the firm. It will look more productive. But each of these shifts (what Bruce MacEwen calls ‘labor market arbitrage’) is a one-off gain. Once work has been moved to paralegals and contract staff in a low-cost city, that tactic cannot be tried again. In effect it is a re-basing of the productivity curve, giving no recurring advantage to the firm. It is also a tactic that is easy to adopt, so it gives no firm a lasting advantage. Looking to more long-term changes, a firm might turn its back on low-value work and build a capability to do higher-margin work. This is not an easy strategy, unless few other firms identify the same opportunity. Real increases in productivity or yield will only come if firms find ways to generate more income from the same amount of fee-earner work. Alternatively, continuing improvements to productivity and yield come from products or services that can generate income without incurring costs at the same time. At present, however they resource the work that they do, most firms incur salary costs at a similar rate to the income they generate (unless they run below capacity). Firms with products or services that ‘make money while we sleep’ (as a managing partner once described them to me) will produce income that goes straight to the bottom line once the investment costs of creating those products or services have been met. Looking at these options, there are clearly limits to the power of firms’ business development (sales and marketing) or HR functions to improve the long-term financial health of the firm. They can affect work levels and resourcing (the first four bullet points), but they are unlikely to play a central role in shifting the firm’s focus (the last three bullet points). To go back to my agricultural metaphor, the combination of successful sales/HR work is like a farmer buying a new field. The farm will generate more income with that field, and more profit, but overall profitability or yield is not changed. Real improvements in yield come from using the land more intelligently by developing better farming techniques or leveraging new technology to extract more value. Similarly in law firms: changing the way work is done, the kind of work that is done, or the products and services the firm provides, is a job for those who understand the work best — together with those who can see into the future. In a law firm, those people should be in the leadership function together with knowledge leaders and (because that is the direction of travel for the foreseeable future) technology leaders. Firms that really want to make lasting changes to their productivity beyond one-off improvements to process or labour market arbitrage and without overworking their staff, need to use their knowledge and technology teams better. If they continue to rely solely on BD and HR, their gains are more likely to be short-lived. When firms turn to their technology and knowledge teams, they need to be sure that those teams are capable of providing the help needed. That will be the subject of the next post. I have written before on the difficulty of measuring the return on investment in knowledge activities. Prompted by a couple of recent conversations, I have been pondering the issue a little more. What follows is a rumination on how successful knowledge activities might be identified within a law firm, especially over a period of time. In the past, some knowledge folk might have responded to a question about the value of the work they do by pointing to volumes of documents in a know-how database. All this demonstrates is the amount of work done — it doesn’t help people understand how the firm benefits. Nick Milton helpfully summarised some ways in which business might benefit in a blog post earlier this year (together with survey results showing which measures were most commonly used). In addition to the kind of successes that Nick points to, I have also been fond of using qualitative assessment of knowledge activities. Often it is easier to ask people (whether inside or outside the business) about their experience of KM work. Their responses serve a double purpose — as well as indicating how successful past activities might have been, they can also suggest fruitful directions for the future. However, I have become more doubtful about the merit of highlighting one-off successes or of depending on how people feel about a service that is designed to make them feel good. These may give an impression of how well certain parts of the knowledge function perform, but they don’t help with a wider picture. After reflection, I think the answer can be found in an analogy I have used before. Back in June 2014, I likened knowledge management to farming. In order to improve the yield of the organisation (by whatever measure is appropriate), managers need to enhance people’s natural capabilities (fertilising for growth), while reducing the impact of adverse conditions (sheltering crops from bad weather). That isn’t possible without a deep understanding of the environment within which the organisation works, the natural capabilities of the people within the organisation, and the value of whatever the organisation produces. The key to measuring the value of our knowledge activities is yield. If the set of things that we do to improve productivity are successful (allowing for the fact that some may be more successful than others), the firm’s yield will improve. The next question is how yield might be measured in a law firm. The answer here, I think, depends on whether you want to consider the firm in isolation or compare it with the market as a whole. Financial data that is available within the firm may not match what is made available for publication. Generally speaking, productivity is an expression of the ratio of outputs to inputs. At the national level, the UK Office for National Statistics derives labour productivity estimates by dividing measures of output by some measure of labour input. In professional services, productivity is measured by the turnover of companies adjusted for average wage rises in the sector. Within a firm, inputs and outputs can be measured precisely. Firms know how many people they employ, how much they are paid, and how long they work. They also know which of these people contribute directly to the firm’s turnover. Productivity could therefore be measured as a ratio of turnover per person (full-time equivalent or otherwise) or per hour worked. Such a measure would not be useful for comparison over time, since inflation might increase fees without a real increase in yield. Using the ratio of income to salaries would smooth out such variations, since inflation in fees is likely to run at a similar rate to pay inflation. Over time, then, a firm can see how productivity changes from year to year. As law firm knowledge management efforts tend to focus on the income-generating side of the business, examining the productivity of fee-earners in isolation over a significant period might help to show whether those efforts have had a real impact. If comparison beyond the firm is needed (does our productivity match changes in the market? ), then firms need to find publicly-available datasets. The most easily-accessible data is collected annually by The Lawyer (in the UK) and The American Lawyer (in the US). Both the Lawyer UK 200 and the AmLaw 100 calculate revenue per lawyer (RPL), which can be used as a proxy for more precise measurement of productivity. Because this measure does not take account of inflation, comparison between firms is only possible in a single year. On its own, that comparison is almost worthless. Factors such as the firm’s employment profile (does it depend on low-cost associates or is it partner-heavy in high-cost locations? ), its client types, or work profile, little real insight is possible. At best, firms might pick comparators they know to be broadly similar. There is a useful way to use published figures for revenue per lawyer. That is to compare the trend in a firm’s performance with a larger set. For example, the median RPL figure for the top 100 firms can be plotted against time. That line is likely to ascend, with occasional dips when the wider market was under stress. (I would use the median in preference to the mean, in order to reduce the impact of particularly high- or low-performing firms in any given year.) When the RPL for a single firm is plotted alongside the whole set, one can see whether the profile of the line matches that for the whole set (performance in line with the market) or whether it rises more steeply (outperforming the market) or more shallowly (underperforming against the market). This graphical information, when combined with what is known inside the firm about any special factors, allows the firm to understand better how well it is doing in the market and what might be causing any difference in performance. The special factors could include investment in knowledge activities, as well as significant client wins or losses, so some caution is still needed. I suspect very few firms do this kind of meaningful analysis. In a later post, I want to explore the implications for law firm support teams of not having this kind of insight. Over the last month, The Lawyer published a series of articles in which the natural structure of law firms was debated by Bruce MacEwen, Mark Brandon and Tim Bratton. Each of the articles, and most of the comments on them, is worthy of careful reading and reflection (registration is necessary to read the articles on The Lawyer website, but they are free to read). There are interesting points in each of the articles, so I particularly want to highlight some of the things that struck me. I aver that since lawyers can be legalistic, they (wrongly) translate the legal fact into the operative/managerial fiction that they ought to have a co-equal hand in control of the enterprise. They ought not. Yet it would be unavailing at best, and a career-ending injury at worst, to explain that to most partners when they attempt to grab the steering wheel. The result of this analysis is that perspectives on legal business from outside the partnership are almost always deprecated — even when those alternative views are better for the organisation or for clients, or are rooted in a more robust understanding of business — if partners feel that their personal status might be worsened. Each of these three components is very different now to 25 years ago, and each provides opportunities for different types of expertise. Clients increasingly want advice on what to do that is not couched purely in terms of the legal options. They want more rounded advice, taking into account the personal and/or business context in which they act. Lawyers ignoring this dimension are becoming increasingly irrelevant. That, in turn, leads lawyers to have greater respect for expertise that they do not possess. The kind of legal material that is freely available online may only be capable of answering basic queries about the law, but that is far more than used to be possible without access to a comprehensive legal library. This has effectively taken work away from lawyers, and the process is only accelerating. The availability of such material (and the more detailed content within legal subscription services) has enhanced the utility of anyone within a law firm who is able to extract information quickly and accurately. Often these are not lawyers, but specialist information and knowledge professionals. Finally, the commoditisation of law firms’ execution capability has moved work from trainees and junior associates to paralegals, project managers, systems specialists and sales and management experts. Very few of these are lawyers, and their status within firms is growing. The partnership model for law firms may not be dead, but it may need to start welcoming a range of new professionals. I’ve always found that success itself is rather a good guide to, er, success. Pulling a dusty directory from my shelf, dated 1990, I can scan through the top law firms in the UK, 25 years ago. Clifford Chance. Linklaters. Freshfields. Allen & Overy. Slaughter and May. If Amazon, Apple, Facebook, Google and Tesla are all still around in 25 years, I’ll eat the tablet you’re reading this on. Freshfields, it is worth remembering, is older than the United States of America. Past performance is not a reliable guide to future performance. The value of your investment may go down as well as up. In 1990, law firms only had to worry about competition between themselves. In the decade that followed, they even saw off attempts to enter the legal market by the big five accountancy firms (including Arthur Andersen, whose attempt was undermined by its own troubles). Now clients can look to a wider range of legal services providers, all of which are reportedly growing market share (albeit from a small base). I am not at all confident that the same names will appear at the top of the legal business lists in 2035. BigLaw is getting grayer because the 100-year old gold factory is breaking down. Law firms’ portion of corporate legal spending is no longer growing, as in-house lawyers, NewLaw managed services shops (United Lex, Axiom, Counsel on Call), and technology are all curbing demand for traditional law firm services. The best economic play for 55- or 60-year old equity partner is to ride out the existing model with the dwindling but still substantial number of Baby Boomer senior in-house lawyers who are themselves not too anxious to change. [S]ome firms are several years into strategies that have the potential to take market share from peer firms. Further, the innovation teams inside these firms are having the time of their professional lives because the work is so collaborative and creative–the antithesis of billable hour work. What is also clear is that many competitors just can’t muster the leadership nerve to make similar investments. In the years to come, some BigLaw firms are going to pull away from the rest, becoming a magnet for talent and then clients. Younger lawyers are going to thrive there. Another portion of BigLaw is going to gradually fade away. The debate about the partnership model may well be resolved by the passage of time, rather than deliberate action. I found the most interesting part of Mark Brandon’s contribution elsewhere than in his article. It was in the comments where he has an exchange with Jeremy Hopkins. The deficiency of the partnership structure stems from the imbalance of influence – with lawyers leading on things that professional leaders should be – and the lack of permanent capital enabling long term thinking and investment in client relationships. …I doubt many non-partner senior managers from law firms will disagree with me. I think it is because the law, and law firms, are infinitely more complex than anyone gives credit for. I do think, though, that the challenge was summed up very neatly to me by the ex Big Four marketing professional opining on a colleague’s determination to teach lawyers a thing or two. The point about complexity is a powerful one. In addition to the three aspects to legal practice noted by Charlie Geffen, one has to factor in the existence of a range of very different professional practices — litigation, real estate, corporate, commercial, regulatory, and so on. Each of those is susceptible to different market pressures so that one’s approach a partner in the insolvency team would have to be very different to that taken when dealing with a real estate partner. They also practice Geffen’s three facets in varying amounts and in different ways. Commoditised execution capability for a corporate team with a ‘lumpy’ workload would need to be managed very differently from that supporting the steady caseload of a real estate practice. The information and knowledge needs of specialised regulatory lawyers are likely to be very different from those of transactional lawyers. Blending all these components together should suggest that full-service law firms are far more complex beasts than any legal service provider that concentrates on just one of Geffen’s facets or on a reduced set of practice areas. That complexity may also lead to forms of competition for support and focus of internal resources that is absent in simpler businesses like manufacturing or even some other professional services. I have discussed complexity before on the blog, and I think it is poorly understood. One aspect of this misunderstanding is that people often try to reduce it to simple terms. That may work for a while but, before long, reality reasserts itself and the simple structure breaks (often to be replaced by another version). Managing in a complex environment means understanding and accommodating an unpredictable array of actions and activities. Rigid and unforgiving management structures are poorly suited to this. Engagement with a wide range of members of the complex system will almost invariably produce a better outcome. Some aspects of partner behaviour, reward, support and participation should be improved. But as Mark Brandon points out, partnership provides that engagement. But what about the business model? I would like to highlight an important omission from the debate. Which is the voice of the client. What does the client want from ‘tomorrow’s law firm’? The Amazon et als do not succeed because of their structure. They succeed because they not only know what their customers want, but more pertinently they continually invest in knowing what their customers don’t even know they want until they have it. This is called product development or R&D in most sectors. When I was a GC looking at professional life through a client lens, the best external advisers helped make my job easier. They did this by knowing what I needed, in the very best cases before I did. As someone helping to run a client-focused business, this is always front of my mind. Business models and product development facilitate effective client service far more than corporate structures ever will. As it happens, I think these are areas where many traditional law firms fail miserably. There has been a huge amount of innovation in the law over recent years. As Jeremy Hopkins pointed out recently, much of it has taken place within in-house legal teams. Businesses providing legal support services (such as publishers and technology suppliers) have also driven changes within law firms. And then we have the new legal businesses, such as the one that Tim works for, all of which have examined the client experience and adopted a different business model to improve the service they provide. There have been some changes in the way firms deliver their services, especially in the use of technology and specialised execution capability. Very few law firms have fundamentally changed their business model. Bruce MacEwen recently took a look at the R&D question. By comparison with other sectors, law firms invest much less of their annual revenue in activities that could be termed R&D or product development. That isn’t to say that they don’t develop new things, but that development tends to come about in a more haphazard manner. Partnership may be fine for the full-service law firm, but other legal businesses whose services are more streamlined and less complex appear to be better at adapting themselves to client need. There appears to be a strong correlation with corporate structure, but I don’t think there is a causative link. Partnerships could easily adapt to invest more in client service than they do currently. They might even be able to do so speedily. I have tried answering a question like this before, but this time I want to approach from a different direction. Previously, I looked at how much a firm might reasonably invest in knowledge management (the input). This time, I am more interested in outcomes. When considering law firm financial matters, my first call is usually to Bruce Macewen’s site. As expected, I was not disappointed. A commonly used public measure of law firm health is a simple one — profits per equity parter (PPEP or PEP). The legal media like it because it gives them a handy figure to build into headlines and league tables. But actually it tells us nothing meaningful — it is too easily gamed. Bruce dislikes it too, and in one article suggested a host of alternatives that firms could use for themselves. Quality and morale of professional and support staff. Any one of these would be a good starting point for assessing the value of any activity within a firm. If one makes a change and then sees a shift in one or more of these measures, it is possible to ascribe the shift to the change. However, there are two very important caveats. First of all, it is important not to cast any of these metrics as targets. Setting a target doesn’t help people understand what they should do to meet it (and also implies, rather rudely, that people aren’t already doing all they can to help the firm perform at its best). Secondly, many of these performance indicators depend on a huge number of interrelated variables. Take the first, for example: revenue per lawyer. (I would prefer to measure this by reference to all employees, not just lawyers, especially as law firms come to rely increasingly on non-traditional roles for client service.) This is a metric approved by McKinsey, and is easily measured and reported. It makes particular sense in a business that depends on people to deliver a service. A large firm with significant fixed costs (buildings, insurance, technology and other infrastructure, for example) will find it hard to make a real change to this number without also affecting some of the intangible factors — client experience, staff turnover, etc. It would be foolish to hope that a single activity (whether that be better knowledge management or improved marketing) could be responsible for a real change in the firm’s financial health. Things are too messy for that. Which factors matter most to the firm? What variables might affect the selected metrics? What does the firm know about those variables? The first should be obvious. There is no point addressing revenue per lawyer (or profit per employee) if the firm is actually more bothered about its exposure to a small number of key clients than about its profitability at present. This is a strategic question, but I think few firms have such a clear view of their priorities without seeing a list such a Bruce’s of the issues that might concern them. Once they do, it is important to work out which factor is the most important — which will always command more investment than any other? The second point is an expression of my second caveat above. Once we know what really drives the firm — what is its highest priority — we need to understand how performance in that area is influenced by activities, actions and culture within the firm as well as the wider environment. That might be possible as a desk exercise, but it is a task better done by engaging with a wide cross-section of the firm. This is the third point — in most situations, the collective knowledge of the firm itself will give the best insight into how things are now and what might be possible in the future. That engagement could uncover knowledge about clients and their markets, about the firm itself and the people within it, and about infrastructural or other opportunities and challenges. Exposing this knowledge is something that should be at the heart of the firm’s knowledge activities. A survey won’t do — what people say when they mean what they say needs to be carefully uncovered and intelligently analysed. Once there is a better understanding into the way things are, the firm can start to think about what activities and actions might change things for the better. Sometimes that will be an obvious choice, but often it will be necessary to test a number of different actions and see which ones make a lasting difference. Sadly, many firms start with the fourth step. Worse than that, they invest significant sums in large-scale activities that they cannot then prove to have the benefits they expected. The result? At least, wasted time and money. At worst, disenchanted clients and people, to the extent that the firm risks collapse. If you are interested in going about things the right way, using this four-stage process (or something tailored to your needs), please get in touch: I can help. Knowledge what (management or capability)? Earlier this week, David Griffiths published a thought-provoking post summarising the current state of organisational knowledge management. He highlighted some real concerns, but his conclusion is a positive one. The past needs to be forgiven, treated as a learning experience. The future is about Knowledge Capability. This requires a change in mind set. Knowledge Capability is not about managing a resource. Knowledge Capability is about embedding, developing, sharing and, most importantly, activating a resource by better coordinating emergent conditions. This means expanding understanding, influence and integration in such a way so as to enable people to develop as sense makers, problem solvers, decision-makers, collaborators, managers and leaders. People can choose to ignore the inevitable, but, to remain relevant, this is the future. Knowledge Management maybe dying a slow death, but Knowledge Capability is alive and kicking! The history of KM is littered with the dreary battles about nomenclature. I have no intention of starting another one. (And nor has David, I think.) I am, however, torn between redefining an existing term and inventing a new one. In the end, both demand a similar effort. “Knowledge Management” is “Management with a focus on Knowledge”. Management is what we do to make organisations work; to make them prosper and succeed. And if we don’t manage with knowledge in mind, then they won’t prosper and succeed to the same extent. This gives a clear message to be delivered when discussing ‘KM’ or ‘knowledge management’. Often, however, people hearing that term bring their own (mis)understanding to it. Typically, they start with an analogy to information, document or records management, where the phrase refers to a thing (which is often understood as being close to knowledge) that needs to be managed. As a result, those arguing for a more nuanced meaning must first wrestle it away from often basic conceptions of classifying, storing, retrieving and organising. Worse: those activities tend not to be highly valued by organisations, and that affects the perception of value that might flow from intelligent knowledge management. By contrast, organisations also manage with people in mind, or money, or customers/clients. Those functions (HR, Finance, and Sales/Marketing) tend not to use the term ‘management’ at all. People also understand better the value that they provide for the business — often to the point that they are represented directly at the most senior level. The other business disciplines are better developed and understood than knowledge management. This is an ideal opportunity to reframe people’s understanding of our work. Referring to ‘knowledge capability’ can help to do this — it is much clearer about what will change as a result. It also refocuses away from the possibility of managing knowledge towards making changes in organisational practices and people’s behaviour. In its early days, knowledge management grew out of information management and technology. It is not surprising that those fields still affect the way people still perceive the discipline. Newer influences — such as psychology and other behavioural sciences, organisational design, strategic management — have given KM a role that should place it much closer to the heart of the organisation and the way people work. This video by Patrick Lambe illustrates this journey. He describes a project to create a set of competencies that is clearly distinct from historic descriptions that were rooted in information management. For me, that is the heart of the way modern knowledge activities should be appreciated. They prioritise how people work towards improving the success of their organisation — using knowledge. The older approach (which can still be seen in some places) thinks first about knowledge and what might be done with it, rather than organisations or people. If you want to move your firm towards better use of knowledge, please get in touch. “Why?” is the question of the moment. Fewer and fewer people accept what they are told at face value. Many organisations, professions and individuals are treated with a modicum of mistrust. Until we know and accept why someone is behaving as they are, we may be suspicious of their motives. In particular, the way we think about work is changing. After a century of treating work as a mechanical activity, typified by the Taylorist school of management, we are being guided by a number of critical thinkers to wonder why things are organised the way they have been for so long. We know that even a simple instruction will often be freighted with meaning — the bigger picture. Until we know and accept what that picture shows, we may be cynical about the task. There are many reasons for this suspicion and cynicism. Everyone will have their own combination of factors. But one stands out for me. The pervasiveness of alternative sources of information means that it is harder to conceal the impact of decisions made. These sources of information are not the traditional media or sanitised official channels, but networks of individuals sharing items of genuine interest. And in that sharing, as Euan Semple pointed out earlier this week, intent is critical. Interested vs. Interesting”. Eric’s article is particularly illuminating in the way he distinguishes between the core intent prevalent in public social media and that which is most useful in the use of social tools within organisations. Facebook and Twitter are social networking platforms I’m sure many of us are familiar with. They were created and became popular during the Culture of Personality. It’s not surprising these social platforms define success by things called “Likes” and “Favorites”. While there are many great benefits to these platforms, many people use them to share personal information. And on these tools…they strive to be the most “interesting” or liked person. In our professional careers, having a message ‘Liked’ by our peers doesn’t necessarily have a great correlation to our success. So, it doesn’t make a lot of sense that the way we use Facebook and Twitter today would be helpful in collaborating with or leading our teams. I argue, it’s actually not a problem with the tools. It’s a problem with our intent. I’ve heard from many leaders who say they struggle with enterprise social because they fear posting messages that are not insightful to their team… Their intent is to be interesting. I think they have it backwards. The ‘Culture of Personality’ that Krause refers to was posited by the historian Warren Susman as a development resulting from the 20th century decline in natural communities in favour of larger cities and organisations where it was hard to know people well. During this time, we think of people with qualities like knowledge and communication skills. People valued “personality” more so than ever. Are you outgoing? A good public speaker? Are you liked among your peers? In prior times, when small farming communities were more prevalent and people had real connections within and to those communities, Susman identified a ‘Culture of Character’. We think of people during this time as having qualities like being helpful. People valued, above all else: “Character”. Were they good people? Were they generous? Did they benefit and provide value to their community? Kraus argues that meaningful use of social tools within organisations demands that people use them with the kind of intent that comes with a culture of character. This resonates with something I have linked to before — Pixar’s ways of selecting people to work well within that organisation. The key factors are described by Randy Nelson (then Dean of Pixar University and now Head of Artistic Development and Training at DreamWorks Animation) in this video clip. The key section for now is transcribed below. What we’ve gotta find is people who are extremely broad. And the predictor there, we want somebody who is more interested than they are interesting. Yeah, anybody can have a pink Mohawk and enough piercings so that wind blows, you whistle without pursing your lips. That’s interesting and that’s easy to get. Interested is tough. That’s a real skill and I’m sure all of you have that sense, somebody in your life who you just always think of when you think, that’s the person I want to talk to. Why? Because they’re so bright? Yeah they’re bright. But what they do is they amplify me. They give me what I need. I say, I’ve got a problem and they lean in. They don’t say, “Oh yeah, I got problems too. I bet my problems are more interesting than your problems.” No. They want to know what you want to know. They want to know what’s bothering you. That’s the kind of intent that builds an organisation where people should be less cynical and suspicious because they understand why others are behaving the way they are — their intent is clear. Surely that is a meaningful goal for any organisation? Increasingly, good people will move away from the places where being interesting is valued more highly than being interested. Having signed off my last blog post suggesting that a better understanding of the environment within which organisations work is a necessary precondition to better management, I am planning a series of posts that will look more closely at the legal ecosystem of which law firms are a part. Where I’d suggest the debate has got a little hysterical, is the widely reported perception that the increase in Public Access authorisations represents a wholesale strategic re-positioning of barristers’ business plans with a view to a major onslaught on solicitors’ territory. More likely, it is a sensible investment of relatively small amounts of time & money to put oneself in the frame, without obligation, for possible opportunities while meeting mandatory CPD requirements. Rather than dealing in hypotheticals, then, a proper assessment of the legal environment needs to focus on what is actually happening. That also means that one can only describe the current situation. It is worth being clear about the limits of my inquiry. This is a partial overview (in both senses of the word). I can only write about what I know — there may be other factors invisible to me that affect how specific firms or practice areas will develop. Also, I am only concerned (for now) with legal practice in England and Wales — and primarily commercial legal practice. Nonetheless, I hope a general overview will provide a useful starting point for firms and lawyers to think carefully about their own more detailed ecosystem, how it may change, and what they might do to influence or mitigate those changes. I want to explore each of these in more detail in later posts, but here is a quick summary of how they interact. In classic Coasean terms, the firm exists to do work efficiently. 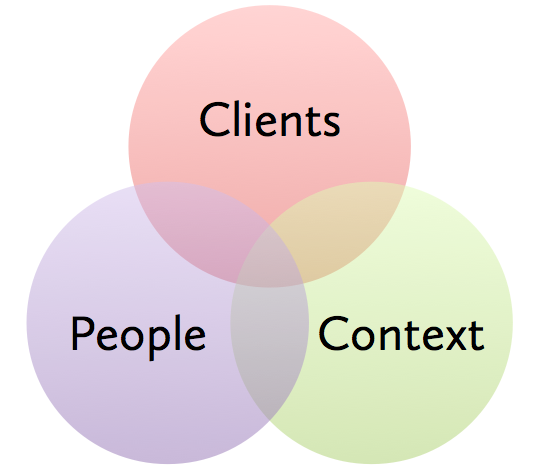 Clients sit on one side of this equation, and the people within the firm on the other. ‘People’ includes those directly employed in doing the work requested by clients as well as those providing services to the firm (this is an increasingly permeable distinction, and I will look at it in more detail in the relevant post). The firm needs to balance supply (people and other resources) and demand (client instructions). This isn’t a simple thing to do, because of all the other things that firms have to content with — the context within which they operate. That context includes the material that lawyers have to work with (the law), professional regulation, technological and other change, and the pressures of the market. Managing the firm, and planning for its future, requires law firm leaders to understand the complex interactions in each of these areas, as well as across the boundaries. For example, changes in the regulatory sphere might prompt a client to change the nature of their in-house legal team, resulting in less work (or work of a different kind) flowing to the firm. Likewise, third party suppliers of legal information or technology to firms and clients can affect the way each relates to the other by changing their commercial terms or the products and services themselves. Most of this is not unique to law firms, but there are some special features of legal work or the legal market that I want to draw out over the next few posts. The first of those will look at the part clients play in the legal ecosystem. As a schoolchild, despite my mother’s agricultural ancestry, my understanding of farming was as basic as the writer of the classic hymn, “We Plough the Fields and Scatter.” The hymn suggests that all one needs for a plentiful harvest are some good seeds, a ploughed field, and a beneficent god to bring the right weather. This scientific approach is merely the culmination of millennia of human development, from the Neolithic period onwards. As we learn more about how other species can be manipulated, or the earth itself can be nurtured to support greater yields, it is possible to feed a growing population. Modern farming therefore depends on the advances in techniques and materials that are available. Cereal crops are now planted by GPS-guided seed drills that allow the farmer to ensure that as little seed as possible is wasted — no longer is it scattered wantonly. Plant and animal species have been bred for improved yield over centuries. A modern farm is as far from natural growth as it is possible to be. By comparison, many aspects of our human organisations depend heavily on trusting people to work effectively. Worse, where we aim to make improvements, there is often little science behind them to show that they will actually increase productivity. As a result, people often struggle with poorly designed systems that obstruct their efforts to work better. I keep coming back to agriculture as a metaphor for the way we manage organisations. I think it is especially relevant for knowledge management. In order to improve the yield of the organisation (by whatever measure is appropriate), managers need to enhance people’s natural capabilities (fertilising for growth), while reducing the impact of adverse conditions (sheltering crops from bad weather). That isn’t possible without a deep understanding of the environment within which the organisation works, the natural capabilities of the people within the organisation, and the value of whatever the organisation produces. A manager armed with that understanding (and an awareness of how the different factors change over time) can test different approaches to improving productivity, based on the factors that are known to make a difference. Managing in this way means that time isn’t wasted on things that won’t make a difference (even if the organisation next door is using them). Testing different techniques allows success to be observed — unsuccessful interventions can be stopped without significant loss. I have never heard a farmer blame the wheat for not growing properly when they try out a new cultivation technique, or the cows for a reduced milk yield when the feed mix is changed. Farmers often complain, but they know to change the right things when they can. Organisational leaders too often complain about the wrong things and therefore make the wrong changes. Poor organisational productivity is as often a product of a badly managed environment as improved agricultural yields are of painstaking land management. My monthly copy of The Word magazine arrived last weekend. As usual, it is full of interesting articles about music, film and books. This month, however, there is a bit of a sporting flavour. This is provided by an interview with Ed Smith, who has combined a glittering academic career with top-level professional cricket, including playing for England. The interview itself is in epigrammatic form, but a number of Smith’s comments rang true with me when considered in a business context. Here are some excerpts. Beware Academies — You could take the Platonic or Aristotelian attitude to creating winning sportsmen. The Platonic one is that you have an academy and you tell them how to do it. The Aristotelian one is, let them find out by trial and error what works and what doesn’t. … Sometimes I think that rebranding something as an academy gives it some legitimacy. It gives it none. Too often you get enshrined versions of mediocrity or systematised blandness. When we think how people learn in organisations, we are often torn between Plato and Aristotle: between the training curriculum and learning on the job. I don’t think Smith’s point is that we should turn our backs on the Academy and embrace enlightened amateurism exclusively, but that we need to think carefully about the outcomes of different types of learning experiences. We also need to consider whether the people in the Academy are actually the right ones. You have to trick your conscious mind — Bob Dylan said creativity is not a freight train on the tracks. It’s not something you can control. The best thing you can do is not get in the way. Most creative people have a cooperative subconscious. They keep their subconscious and rational minds aligned. The problem is, professionalism wants to understand how that works. You get some young player who’s very inconsistent and try to make him consistent. …[Y]ou take somebody who is intermittently brilliant and you make them never brilliant. This is a really perceptive comment about how we nurture brilliance of any kind. Often the hothousing of talent actually flattens it. Just like plants, people become more vigorous when they are subjected to the buffeting of their natural environment. When we take them out of that environment, and isolate them from the wind and rain (in the case of plants) or failure and feedback (in the case of people), we make them weaker rather than stronger. In the end, Smith is probably right that individuals are probably better off managing their own creativity and brilliance. When organisations get involved, they run a real risk of losing the brilliance along with the mystery. It’s not about passion — Anyone can go around beating their chest; it’s winning that’s so damn hard. … I don’t pay good money to watch a conductor stamp his feet. I pay to listen to good music. The choreographer George Balanchine once said that the more he wanted passion, the more he found himself having to talk about precise, very technical things. This last sentence is a real gem. So often we see so-called ‘gurus’ or leaders talking about the need for passion, but with very little behind it. Balanchine’s remark is much more useful. People cannot deliver with passion and flair (for the benefit of their clients, the firm or themselves) if they go not have a perfect grasp of the technical details. Some of them will never be able to show that passion anyway, but even so they would still have deep technical competence. That has a value in itself. Passion without command of the detail is worthless. Unfortunately, the interview is not online, so if you want more you’ll have to buy the magazine. Alternatively, Smith’s recent book, What Sport Tells Us About Life, apparently covers similar ground.